To meet the unique regulatory, economic and community needs of each state, participating stakeholders in Washington and Oregon have collaborated to develop state-specific goals that are best suited to each state. These goals are being adapted into practical strategies for project and program deployment. Access the full Oregon Solar Plus Goals. An important component of the Solar Plus work is to address structural inequities in the energy system that create disproportionate benefits for some communities and burdens for others, often people with lower incomes and people of color. To this end, the Solar Plus forum developed an Equity Framework to guide strategy and program development. Commissioned by Solar Plus partner OSEIA, the Oregon Solar Plan outlines a plan to scale up solar over the next 10 years. In 2016, as part of Oregon Senate Bill 1547, the legislature created a new structure for customers of Pacific Power, Idaho Power, and Portland General Electric to participate in community solar projects. This program allows customers to jointly share in the costs and benefits of a solar energy system by receiving bill credits for their portion of solar generation. As of July, 2018, the program is still under development as the Oregon Public Utility Commission (PUC) finalizes a number of steps prior to program launch. However, a number of program elements, requirements, and goals are known in the rules. Stakeholders have participated in rulemaking for the past 2 years. This fact sheet provides an overview of the program elements that are known to date. Access the Oregon Community Solar Program fact sheet for more information. 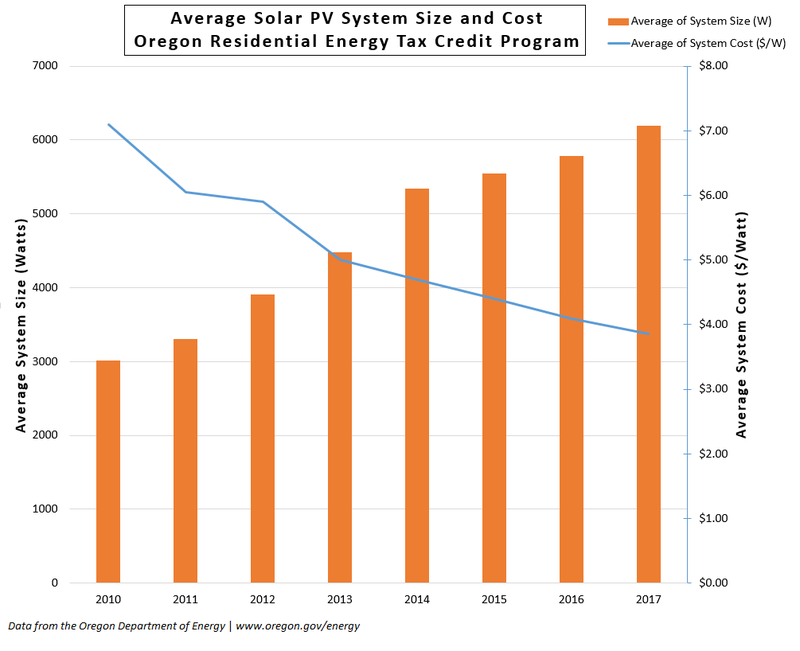 The graph below is provided by the Oregon Department of Energy and demonstrates trends in residential PV system cost and sizing since 2010. The blue line demonstrates the average cost of systems, which has decreased by almost half from over $7.00/Watt in 2010 to less than $4.00/Watt today. Over the same period the average size of systems, demonstrated by the orange bars, more than doubled from 3000 Watts to more than 6000 Watts.